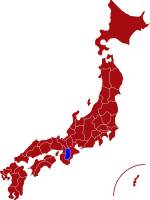 The prefecture of Nara has a deep historical relevance in the formation of Japan and is known for having the most UNESCO World Heritage Sites of all of Japan’s prefectures. Owing to the long history of the prefecture, there are a large variety of traditional cuisine that can only be found in Nara prefecture, such as persimmon sushi, wheat noodles and green tea rice porridge. The prefecture’s capital, Nara City, was the capital of Japan from 710 to 794 and is known for the more than 1,000 white deer that roam freely and are said to have arrived in the city along with the god Takemikazuchi in ancient times. Mount Yoshino, in Yoshino town, is one of Nara’s World Heritage Sites and one of Japan’s most popular cherry blossom vantage points. With over 30,000 cherry trees planted on and around the mountain, it is an unparalleled sight during the cherry blossom season. 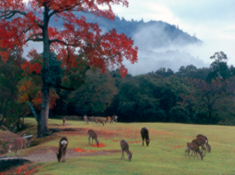 For more information about Nara prefecture, see their official tourism website. Air - The closest airports to Nara are Kansai International Airport amd Osaka's Itami Airport, both of which offer a direct limousine bus service to Nara's two main train stations. Journey time between the airports and Nara is one-and-a-half hours and one hour respectively. Rail - Journey time from Tokyo to Nara using the high-speed bullet train to Kyoto and local service onwards is around three hours. Nara Park - The park is Nara city’s largest and is a stunning area, especially during spring when the trees have blossomed. It is here that the majority of Nara’s deer gather. There are "deer crackers" (savoury biscuits) for sale if visitors wish to feed the majestic creatures who, if you’re lucky, will bow in response. 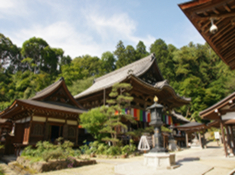 Todaiji is one of Japan’s most famous Buddhist temples and a landmark of Nara. The temple houses the world’s largest bronze Buddha statues and is officially designated a UNESCO World Heritage Site. Wakakusa Yamayaki is an annual festival held in January during which the entire grassland of Nara’s Mount Wakakusa is set ablaze. 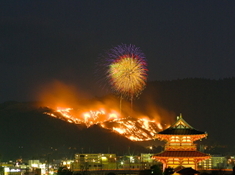 The blaze continues for about 30 minutes and is followed by a spectacular firework display which can be seen from all over Nara. Asuka Village is said to be the birthplace of the Japanese Empire. 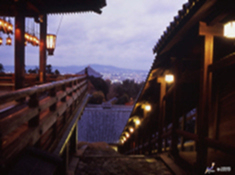 The Ishibutai and Takamatsuzuka tombs are preserved in their original conditions and offer an insight into ancient Japan, while the Asuka Museum houses many relics discovered in the area.